German Martin Kaymer won his second major Sunday at the U.S. Open, qualifying to return to Bermuda for the PGA Grand Slam of Golf. 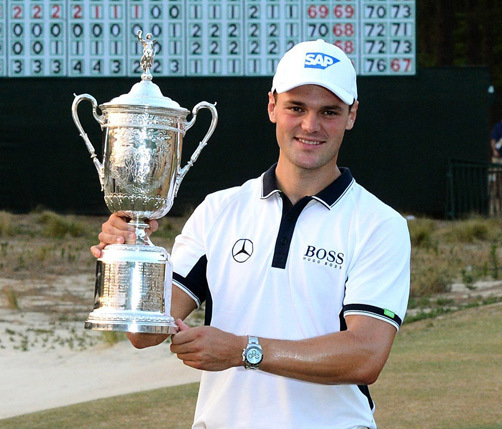 Martin Kaymer, now 29, won his first major at the PGA Championship four years ago. His U.S. Open victory at Pinehurst over the weekend was dramatic in its dominance. Kaymer lead at the end of play on all four days of the tournament and when he ultimately won the championship the second place finishers were eight strokes behind him. American Bubba Watson also qualified for the 2014 PGA Grand Slam of Golf when he won The Masters earlier this year. It’s the second time Watson has qualified as well. The Grand Slam features the winners of the year’s four major championships – the U.S. Open, the Open Championship, the PGA Championship and The Masters. The other two qualifiers will be decided in July and August of this year. The Grand Slam will be played October 13-15 and broadcast to a worldwide audience on TNT. The 32nd PGA Grand Slam of Golf will be hosted by the Bermuda Tourism Authority, Port Royal Golf Course and the Fairmont Southampton. Ticket-carrying fans are allowed to get closer to the pros at the Grand Slam than at any other competitive golf tournament. Because there is only one group during the event spectators are permitted to follow the players down the fairways of every hole – standing just a few feet from the action in some cases. Andy Burrows, Grand Slam Chairman, said: “After Martin Kaymer’s performance at Pinehurst this week and his win earlier this year at the Players Championship, he exemplifies what the Grand Slam is about – celebrating the best players in the world in a given year. The PGA Grand Slam of Golf features a $1.35 million purse, with the winner receiving $600,000; second place $300,000; third place $250,000 and fourth place $200,000.